Facts:The following is a compilation from associated websites and the exchange of communications beginning in November 2014 between VisiPak and Kirby Erdely, Founder, Co-owner of Gorge Design Group, LLC dba Orange Screw. This makes six unique items to manufacture for the two sizes of screws. How did Gorge Design Group find VisiPak? Internet search results prompted a visit to the VisiPak website and then a phone call to VisiPak. Was Gorge Design Group looking for something very specific or wanting suggestions? We needed a tube to serve dual purposes: as a protective sleeve and as a drive tool. In the design and development stage we used ordinary PVC pipe and quickly determined the inconsistencies of the tolerances prohibited this option. The VisiPak website displayed many interesting options, so we called. Q. What is the Gorge Design Group product? 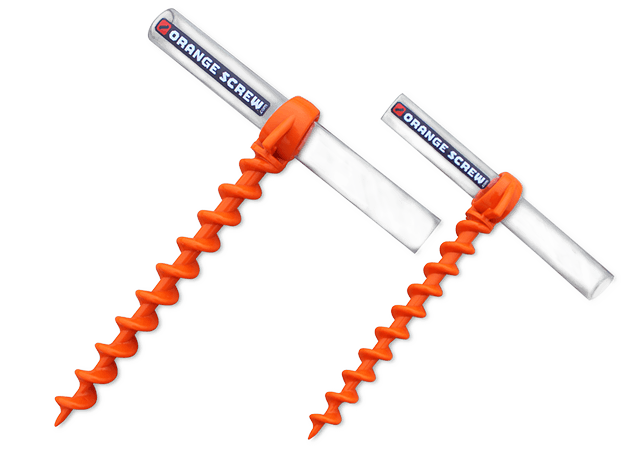 The patented Orange Screw is an innovative and convenient ground anchor made of 100% recycled materials and manufactured in the USA. The patented helical shape, as shown in the image, has incredible holding power, is easy to insert and remove, and is designed for multiple uses such as securing tents and tarps, pets on leashes, canoes and small boats, and many more outdoor and household purposes. We began designing the Orange Screw with family investments for design costs, prototypes and molds. Once we had the molds, we initiated a Kickstarter campaign, launching on August 15, 2015. With the intent to fund materials and production costs for our first full-scale run and finish the package design, our target was $15,000, which we accumulated within about a week! By the end of the campaign on September 14, 2015 we had nearly doubled our goal. Is this product in retail stores for purchase? Our hope was to gain retailers attention with the Kickstarter campaign and in 2016 we will focus on relationships with retailers. Orange Screws currently sell on our website and began to be offered on Amazon.com in March. By changing to VisiPak clear tubing, was money saved or another value gained? Well, as stated the PVC was unacceptable in regards to the tolerances and having an opaque sleeve was less desirable from the marketing perspective. Using the clear tubing made the packaging and branding process more simple because the customer could see exactly what was inside. It’s the clear tubing that really makes our product shine. VisiPak was able to dial in the tolerances for a great consistent fit as well. Was there a problem solved with our tubing? The most significant challenge was ensuring the fit between the Orange Screw itself and the Clear Extruded Sleeve was precise. The major requirement for VisiPak was to produce the clear tubes with critical attention to the tolerances. The small sleeve fit from the start and after a few minor adjustments the large tube was approved. A visit to the St. Louis production facility was satisfying as I was able to work directly with the technicians and engineers to properly determine and approve the size. In addition, I was able to review the finishing process in the rooms designed specifically for cleaning and applying labels. Q. VisiPak is applying the label onto the protective sleeve. Did you expect this service to be an option offered from VisiPak? We asked. VisiPak answered. 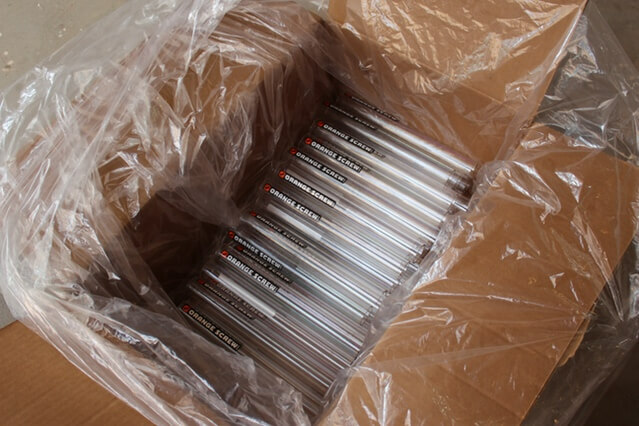 We received our first shipment for testing, 100 small and 100 large, to inspect and review for approval and measurement. These were the first full-thickness, production-quality sleeves we had received and they looked amazing. They arrived cut to length, de-burred, electro-statically dusted, and with the stickers applied. Will you consider VisiPak for package design? We will produce several packaging styles, depending on the market. We began with the easiest first; online packaging, with retail packaging to follow as we build the relationships mentioned above. While visiting the St. Louis facility, it was fun to see how many products are made from or packaged in clear plastic tubing.